Wisconsin Beer Geek: Framrood – Funk Factory Geuzeria & O’so Brewing Co.
Framrood – Funk Factory Geuzeria & O’so Brewing Co.
Friday January, 23rd, 2014 marked the release of the second round of collaborations between Levi Funk, of the Funk Factory Geuzeria and Marc Buttera, of O’so Brewing Company. 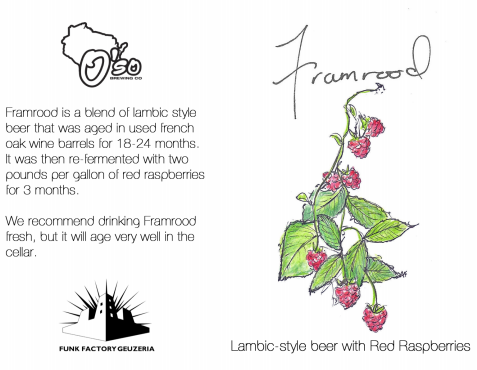 This latest round release featured two beers: Framrood, a raspberry lambic; and Door Kriek, a cherry lambic. The two beers, released exclusively at the party, were “spontaneously fermented” by allowing the hot wort (unfermented beer) to cool in a shallow open vessel referred to as a coolship. The wort cools in the coolship (more on this below) and is then added to the fermenter, in this case French Oak barrels for fermentation. The practice of using coolships, or koelschip if you prefer the Dutch/Flemish spelling, dates back to the early days of brewing before it was possible to quickly cool the wort using some sort of heat exchanger. As early brewing became more advanced, someone likely noticed that if they increased the surface area, and decreased the depth of the wort in their cooling container the cooling process would be accelerated. Over time as brewing technologies advanced, sanitation became viewed as the key to producing consistent beer batch after batch; and the traditional coolships were phased out. The early brewers were right; sanitation is the key to producing consistent beer that tastes remarkably similar from batch to batch. When a brewer can control all aspects of the brew day, and now all aspects of the fermentation process, it is much easier to consistently produce the same lager or ale over and over again. Brewing is an art though, and art isn’t always orderly. Fortunately Belgian brewers in Brussels and the Pajottenland region, like Cantillon, Brouwerij Boon, Brouwerij Lindemans, and 3 Fonteinen continued the traditional brewing process but quickly realized that if they let the cold wort sit in the coolship overnight, it would become inoculated with local microbes and result in a wonderfully complex sour beer. The microbes in different regions developed different flavor profiles giving a unique flavor and aroma, creating a unique beer in each region. Until recently, the common knowledge was that American craft breweries were unable to ferment a lambic style beer because the microbes that produced good sour beers were native to France and Belgium. Fortunately adventurous American craft brewers were not led astray and sought to develop American lambics. Breweries like Allagash, Russian River, and Anchorage Brewing Company led the way; and many followed. Last year Marc Buttera and Levi Funk released the first in what will hopefully be many collaborative lambic, and now here we are with the second major launch event, and a bottle of Framrood. On with the review. Framrood is a blend of lambic style beer that was aged in used French oak wine barrels for 18-24 months. It was then re-fermented with two pounds per gallon of red raspberries for 3 months. We recommend drinking Framrod fresh, but it will age very well in the cellar. Framrood pours a crystal clear raspberry red with a thin, small bubbled white head with minimal retention. The head quickly fades to a thin collar around the edges. The thin collar on the edges leaves no lacing behind in the glass. A mild funkiness, with notes of oak and slightly jammy raspberries leads the aroma. Raspberries linger throughout, although slightly bandaid phenolics sneak up on the back end as Framrood warms to room temperature. Fortunately the phenols only become apparent after Framrood has warmed to room temperature and remain masked by notes of oak and raspberry while the beer remains chilled. Slight funky barnyard, and slightly citrusy notes come to the forefront, with notes of slightly tannic oak notes and tart red raspberries rounding out the first sip. The raspberries take on slightly jammy notes, with the mild funkiness of the base lambic fading slightly throughout the majority of the glass. Untoasted oak and raspberry round out the drinking experience, leaving Framrood with a lingering tart raspberry finish. The tart raspberries play off nicely against a slight citrusy funkiness that intertwines with the various flavors in the beer. With a moderately light body, and a moderately high carbonation, Frambrood is surprisingly refreshing. Framrood is a little on the funky side, at least as far as the krieks that I have had go. It is an amazingly complex beer though with a considerable amount of raspberry in both the flavor and aroma. As an American Wild Ale, this beer should continue to develop in the bottle becoming a little funkier and picking up additional depth as it slowly oxidizes. I only wish I had another few bottles to track how it is going to develop over the next couple years. Framrood is definitely an excellent beer, and if you happen to know someone who was at the release Friday, January 23rd; or if you were one of the lucky few to get a pre-sale ticket, you have a great beer to look forward to. If you missed the pre-sale however, there might be a few bottles available if you look hard enough and ask around on the beer trading sites. This is my first Funk Factory beer, but if it is any sign of what’s to come, it is only a matter of time before Funk Factory beers become highly sought by craft beer drinkers around the country. That’s all for today, check back soon for my review of Funk Factory Geuzeria and O’so Brewing Company’s release of Door Kriek, the second beer released at the Coolship Release Party. Happy Drinking, remember to always Drink Wisconsinbly! Labels: American Wild Ale, Framboise, Funk Factory Geuzeria, Lambic, O'so Brewing Co.